For the novice game programmer with no experience with any programming languages. Covers how C# is used to make a game in Unity3D. Interactive examples give C# code meaning. As more complex aspects of C# are explained the interactivity of example games gains depth. Common programming tasks are taught by way of making a game. 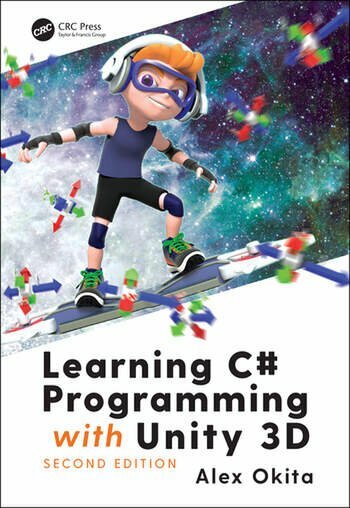 Thereader will understand how to read and apply C# in Unity3D and apply that knowledge to other development environments that use C#. New to this edition: includes latest C# functionality and feratures; new tips and tricks oo tuples, pattern matching, out variables, local functions, binary laterals, digit separators, null propagator reduces, etc. 20 yrs experience in game programming, most recently working with the Unreal Engine 3 writing scripts, building assets characters environments and levels. Also develops Nintendo DS games.